The challenge at Crafty Cardmakers is to post the first card you made and the newest card you've made. This isn't the first card I made. But it is the first card I posted and the first card I have a photo of. The card I made was just a simple birthday card. This card was made before I stared stamping. It was so weird to look back and see just how much my card style has changed during the past year. This is my newest card. I used Magnolia's Snowy Hug. I colored the image using crayola and prisma colored pencils. The sketch I used is from The Sweet Stop. I used the color combination of aqua, dark aqua and white. My card base is aqua that is backed in white and backed again in dark aqua. I backed the image the same way. The strip of cardstock behind the image is white embossed using a Cuttlebug embossing folder (dots) and then I backed it in dark aqua and then in white. I punched two strips of cardstock, one white and one dark aqua, behind the image using a lace heart border punch from Martha Stewart. I layered the white on the dark aqua and added a light aqua with white dots ribbon to the top of the punched strip. I backed my sentiment, "with love at Christmas", in dark aqua and then again in white. I added crystal stickles to all the white cardstock. I added a small snowflake punched out of dark aqua to to the sentiment and added some aquamarine rhinestones to the snowflake and the bottom of the sentiment. I punched out two snowflakes, a large white and a small dark aqua, using two different sized Martha Stewart punches. I added crystal stickles and an aquamarine rhinestone to the snowflake. To the image I added crystal stickles to the snow and white flocking. To finish off my card I added 3 aquamarine rhinestones to the upper left corner. adorable!love your use of aqua! thanks for playing along with us at the Shoe! 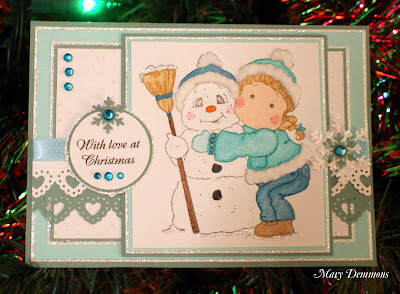 Two fab cards Annie - love the snowman one the MS punch is beautiful. Love how you did this card with different colors! Great job. Thanks so much for entering our Winter Wonderland Challenge over on Stamping Scrapping Challenge Central! Two fabulous cards. The first is simply elegant, and the second is simply gorgeous! Thanks for joining us at both Crafty Cardmakers and One Stitch at a Time! Another great Magnolia card and such great coloring. Oooooh, gorgeous. Love your colours. Thanks for taking part at The Crafty Pad this week. Beautiful card! Thanks for playing at The Sweet Stop! More flocking and more traditional colors. Girl you rocked your first card! I love them both! Thanks for sharing your ANYTHING GOES CHRISTMAS creation with us at Creative Inspirations this fortnight & thanks for showing us your first and last cards at Crafty Cardmakers! Best of luck to you and happy holidays!! I love your first card..CAS but your second card is stunning. Love the colors and the layout of both cards. Thanks for joining us at The Crafty Pad this week. What super cute cards! Thanks for playing along with us at The Sweet Stop! I think your first card is really elegant, but as I am a sucker for Tilda your latest is gorgeous. Merry Christmas and Happy New Year and thanks for joining our First and Last Challenge at Crafty Cardmakers. Hope to see you back next year. Very nice Mary, look how far you've come. Your cards look great. Thanks for playing with Crafty Cardmakers.